Don't miss our recent news and information! There's always a lot happening at Springmont! Nikki is Springmont's Associate Head of School for Elementary & Middle Learning. Cara is Springmont's Toddler/Primary Division Head. Stay up to date with school happenings and upcoming events! Follow us to make sure Springmont is in your feed! The 2018-19 Springmont Fund will be invested in Landschool & classroom improvements. Your support helps us create an environment where every child may flourish. At Springmont, we’re proud of our school and like share the accomplishments of our students, alumni, faculty and staff. Here you’ll find information about Springmont including recent school news, articles about our curriculum and other interesting items. For additional press or media information, please contact Julie Strickland jstrickland@springmont.com or 404.252.3910. 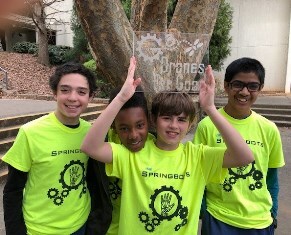 Springmont's Robotics Team, the Springbots, did an amazing job at the G3 Drones for Good competition held at Grady High School on Saturday. Their drone flew really well, scoring 17 points, and the students’ creative problem-solving project, a hypothetical fleet of drones that could help lead people to food, shelter and medical care after a natural disaster, won 1st prize! The judges were so impressed they encouraged our students to start a business. Final rankings will be released later this week, but overall we think the team placed 7th out of 28 teams. Congrats to team members Ian, Timothy, Mason and Siddhu! They are already looking forward to next year's competition. Springmont is abuzz with excitement! Thanks to a generous grant from The Bee Cause Project, we have bees on campus! The grant included a Langstroth hive, beekeeping equipment, fun supplies from the Savannah Bee Company, signage and teaching materials as well as funding for the bees and additional equipment. We hope this is the bee-ginning of a long, successful partnership with The Bee Cause Project. If that wasn’t enough, Logan Pratt, a Primary student's grandfather, gifted us a second hive! Having two hives will greatly enhance student learning opportunities and further our efforts to protect and promote these critical pollinators. Today is Earth Day! Springmont celebrated with a whole-school outdoor assembly! Students shared thoughts, poems and songs and planted seed paper in our new pollinator garden - all guided by one of our school's core values - Stewardship of the Environment!